Canadian pharmacy review | read about our referral program. 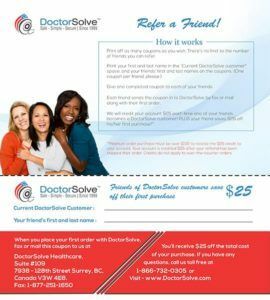 You can save $25 or more just by telling your friends about DoctorSolve’s Online Canadian pharmacy service. For each friend who becomes a DoctorSolve customer, you’ll save $25 off your next prescription drug purchase. PLUS, each friend who places a first prescription drug order with DoctorSolve also saves $25! Click here to print off your coupons. There’s no limit to the number of friends you can refer. Give one completed coupon to each of your friends. Each friend sends the coupon in to DoctorSolve by fax or mail along with his/her first order. 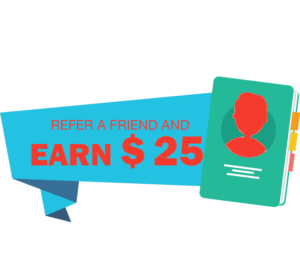 DoctorSolve will credit your account $25 each time one of your friends becomes a DoctorSolve customer! PLUS your friend saves $25 off his/her first purchase of Canadian prescription drugs! “For any of you out there who are wondering if this is THE PLACE!..... let us reassure you, the medicine is the same, only CHEAPER... no adverse results from the medicine looking ``different``... all of our checkup results came back just as good as being on the ``high`` priced American medicine. When the Doctor changed my husband's cholesterol medicine, I emailed the new prescription, the Nurse called the same day, and we had the medicine in a week. We recommend DoctorSolve to all our ‘older’ friends who have to pay for their medicine. 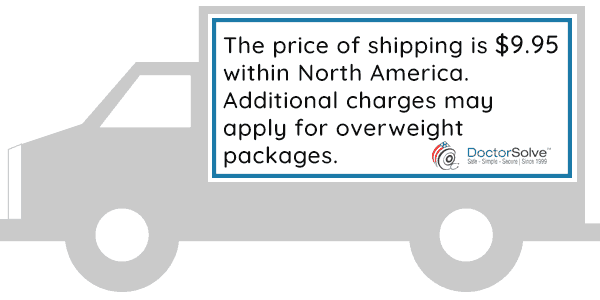 When I told our Doctor (who is an internist) what we were going to do, he said he understood us ordering from Canada. We have been using DoctorSolve since last November, and are ecstatic about you coming to our rescue! DoctorSolve’d be delighted to hear from you! Tell us about your experiences regarding DoctorSolve’s hands-on pharmacy service and delivery. At DoctorSolve, the commitment to providing you with the greatest pharmacy service anywhere is stronger than ever.